The career of the Iranian-American Pianist Soheil Nasseri took an unusual path. Now he is performing in Munich for the first time. Photo caption: For the young Soheil Nasseri, piano playing was an escape from everyday problems. Text caption: Soheil Nasseri wants to have performed the complete Beethoven piano works by 2020. Soheil Nasseri rebelled in his youth. Quite. He was a problem child: an outsider in school, made fun of by the other classmates, pushing back against authority figures. So he spent a lot of time by himself, also because both parents worked. But the form that his rebellion took is somewhat untypical. Because actually this American with Iranian roots is something of the perfect would-be-son-in-law or grandchild: he loved Beethoven as a child, idolized the Russian pianist Evgeny Kissin as a teenager and finally did become a musician himself. This is all somehow the kind of rebellion that parents can only hope for. A biography that reads like a coming-of-age novel that finally leads to the subtle and balanced practice of art. But the reality that the now-36-year-old was fleeing through his music looked very different. Mr. Nasseri meant it very seriously when he refused to participate in middle-class life. He grew up in Santa Monica, California and Washington, D.C., apparently recalcitrant and closed-off from his classmates. Without hardly a friend or connection, expelled from several schools, finally he broke off high school all together. Now Soheil Nasseri lives as a classical musician in Berlin. Although he often performs rather unconventional repertoire he seems to have shed his revolutionary and anti-establishment ethos. But the path there was also unusual. Mr. Nasseri never studied at a college. At the age of five he began to play the piano. His parents, who stayed in the USA due to the Islamic revolution in Iran, introduced him early to classical music. “I knew the music from home,” he said. For his parents in Iran in the 70s it was something of a rebellion to listen to classical music from Europe. M. Nasseri wanted to play these works and describes Beethoven as his “childhood hero”. But he didn’t practice much and played at a mediocre level. Until he discovered Kissin and at thirteen- in a typically adolescent fixation- he started to emulate his idol, leading to marathon-like piano playing. There is nothing new about music helping adolescent children rebel. Like with Soheil Nasseri whose youth played out as if he were the frontman for a punkband: a high-school-drop-out who refused to go to college because of his anti-authority attitude. “As a child everything went wrong,” he told me. At 20 he couldn’t imagine ever going back to school, although he could have gone to a music conservatory based on his talent. Soheil Nasseri chose a more unconventional path. He moved to New York and was able to study privately with Karl Ulrich Schnabel. The love for Beethoven remained and he decided to perform all of Beethoven’s works for piano by 2020, the 200th anniversary. 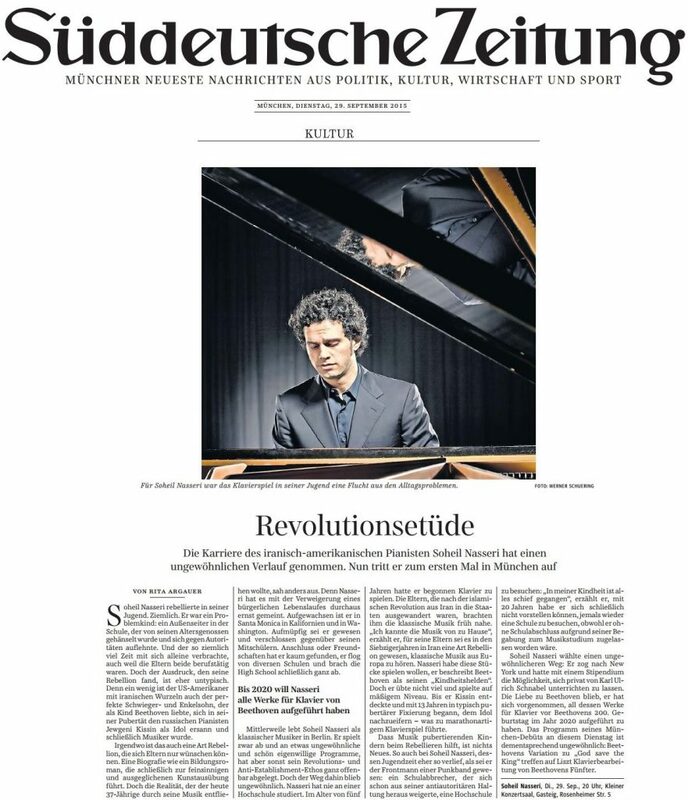 The program for his Munich Debut on Tuesday is commensurate: Beethoven’s Variations on “God Save the King” as well as the Liszt piano version of the Fifth Symphony.